Discussion in 'Blue Iris' started by kevinmike55, Nov 9, 2018. I have noticed that when playing back footage in ui3 from my 4k camera, i get 1-2fps max. This is true regardless of what i downscale too. Playback from my 1080p cams is 10-15fps which is what id like to see on all my cams at home. i ask because I am in the process of implementing a new system at work. The system will have a lot of cameras and be used for both security and production monitoring (its a manufacturing environment). Its essential that multiple users have access from their computers and have very smooth playback when reviewing footage (for simple playback and scrubbing back and forth). Before I move forward with a BI system I want to make sure this is possible (either via UI3 or another solution Im not aware of). If i can solve this at home ill implement at work. computer is an old video editing computer with an i7 quad core, 2 ssds, and a 3tb surveillance disk. clips are recorded to 1 of the SSD's and then transfered to the 3tb spinner once full. I used to edit 4k gh4 footage on it so its more than enough for BI. What is the model generation of the I7 processor ? Do you have hardware acceleration enabled in bi ? Are you using wireless cameras or hardwired ? Are you accessing bi from UI3 via wireless or hardwired ? When accessing via UI3 are you on the local network or at a remote site ? How does the play back look on the bi console ? What is the bi box cpu load when recording only? What is the bi box cpu load when play back from UI3? Is the bi box connected directly to the router or to a switch ? Does the UI3 playback slow when run directly on the bi box ? laptop was using to monitor is on wifi on the same network as bi. For best results, you should be using either the Chrome or Opera web browser. In UI3, make sure you are streaming H.264. All of these I've marked in red are H.264, but the 2160p (4K) option is preconfigured with a resolution limit of 3840x2160 pixels and it also has the highest bit rate limit (8 Mbps) so it is best quality even if you aren't viewing a 4K camera. 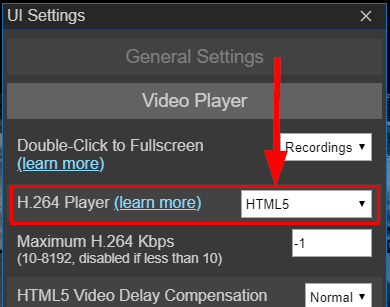 Next, in UI Settings, check that the H.264 Player is set to HTML5. This is the default in Chrome and Opera, and it is most likely going to be the best for you. Then, as long as the system you are running UI3 on is fast enough to play 4K video, it should be fine. If it isn't fast enough, you should see a big orange warning icon appear overlayed on the upper-right corner of the video stream. 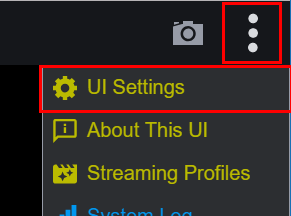 Some of these settings could affect streaming speed, specifically the Video scaling option. And if you are using Limit decoding unless required on any cameras, it could cause temporary low-framerates when viewing single cameras, but it should recover after a moment. playback on BI box in the gui is very slow, starts out ok then just starts lagging like crazy. CPU usage from the task manager is fairly steady between 20 and 30% during both recording and playback. this is only on the 4k camera the 1080p cameras playback fine (some small lags here and there but nothing to note). when i export the video as a clip and play it back it plays back fine, so the frames are getting recorded its just not able to play them back. also the live view of the cameras seems to be fine. All of the optimizations were done as well. One thing that is weird, BI always seems to think my CPU usage is about double or tripple what my task manager shows, could that give us a clue? Is the bi PC deticared to bi, or is it running other programs ? Please provided a screen shot of the windows task manager, processes, sorted by cpu utilization.